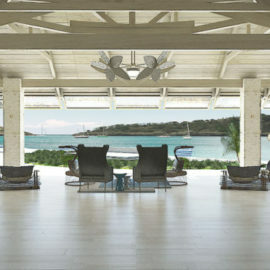 Situated on the most beautiful and longest white-sand beach in Antigua – Dickenson Bay. The home of the „Original‟ Rondovals‟, those in the gardens magnificently enhanced with pool sanctuaries. All Rondovals have been renovated to offer larger bathrooms with rain showers. Conference and Meeting facilities, featuring Admiral Lord Nelson‟s Conference Center of 5000 sq. ft.
Fifteen (15) minutes away from the V.C. Bird International Airport. There are 373 Rooms and suites in 25 categories. 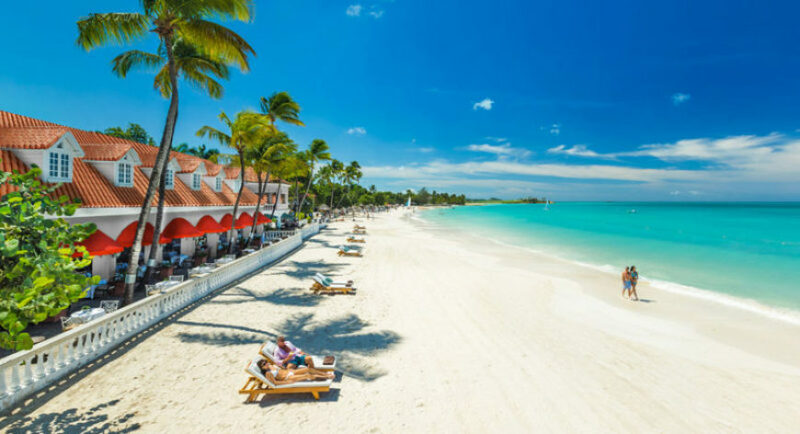 Accommodations range from one storey buildings with patios to Caribbean Honeymoon Butler Rondovals with Private Pool Sanctuary to exotic Mediterranean Honeymoon Romeo & Juliet Ocean view Penthouse One Bedroom Butler Suites and Mediterranean One Bedroom Butler Villa Suites with Private Pool Sanctuary. 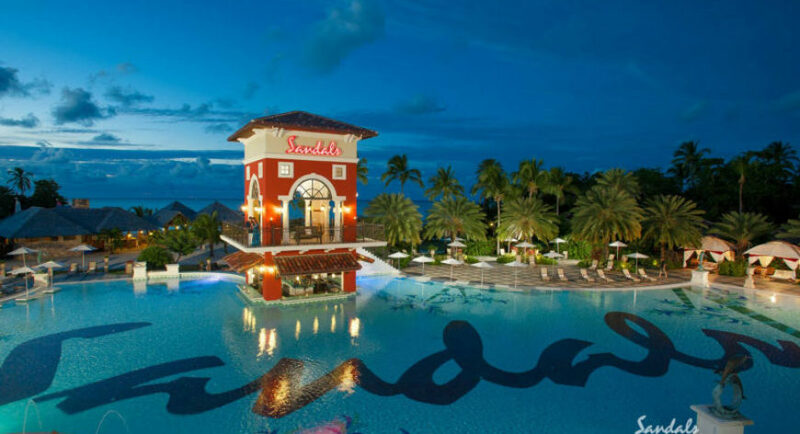 All accommodations offer Club Sandals Service with air-conditioning, king sized mahogany four poster bed, ceiling fan, amenity kit, hairdryer, telephone, private bath and shower, safe, cable TV, coffee/tea maker, iPod docking station, iron, and ironing board. These suites have Italian floor tiles, large flat-screened TV‟s (42”), custom designed mahogany furniture with leather trunks and fabrics from Turkey, Italy, and India. The bathrooms feature Italian Giallo marble, custom his and her washbasins, the latest Kohler Purist bath and shower fixtures, whirlpools and overhead walk-in rain showers. All accommodations have air-conditioning, king-size mahogany four-poster bed, ceiling fan, amenity kit, hair dryer, telephone, private bath and shower, safe, cable T.V, coffee/tea maker, ipod docking station, iron, and ironing board. This suite is furnished with a sofa, a writing desk and a four- poster, king-sized bed. The bathroom has a twin washbasin that is suitable for wheelchair access, a whirlpool tub and separate walk-in overhead rain shower that is wheel chair accessible. The suite is fitted with a large, flat-screen TV (42”) and has a balcony. This is a true one storey villa in paradise. 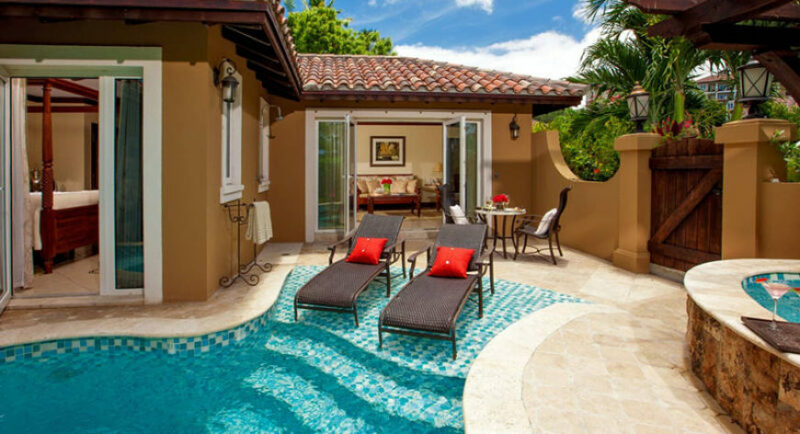 Each villa has an expansive private pool deck which leads to the pool sanctuary & whirlpool. The living room, which is furnished with a sofa, a love seat and a writing desk, looks out onto the pool deck. The bedroom is furnished with a king sized four poster canopied bed. The bathroom has twin wash basins, a roman whirlpool tub and a separate walk in overhead „rain‟ shower. Both the bedroom and living room are equipped with large flat screen TV‟s (42”). This villa offers total romantic seclusion. 24-hr. Room Service. These penthouse vistas offer penultimate views of the Mediterranean Village, Dickenson Bay and fabulous sunsets. The living room and bedroom both lead out to an oversized balcony with chaise lounges. The living room is furnished with a sofa, chaise and writing desk. This is complemented with a hidden microwave and wet bar. The bedroom has a king-sized, four poster canopied bed. The bathroom has twin wash basins, a Roman whirlpool tub and a separate walk in overhead „rain‟ shower. Both the bedroom and living room are equipped with large flat-screen TV‟s (42”). 24-hr. Room Service. 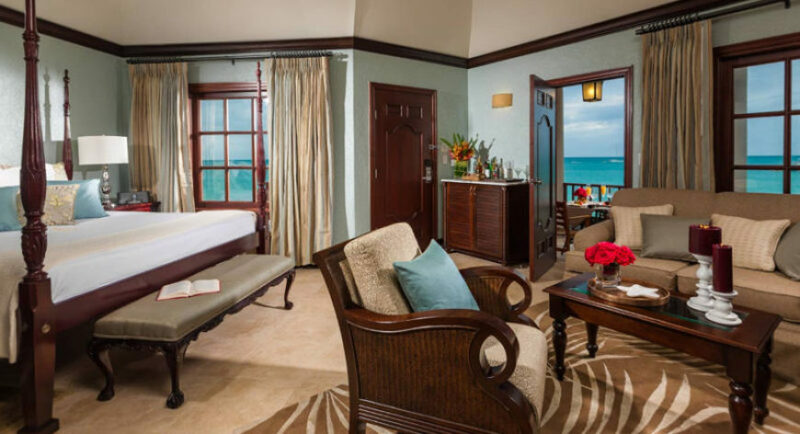 These suites offer panoramic views of the Mediterranean Village pool and gardens, Dickenson Bay and fabulous sunsets. The living room and bedroom both lead out to an oversized balcony with chaise lounges. The living room is furnished with a sofa, chaise and writing desk. This is complimented with a hidden microwave and wet bar. The bedroom has a King-sized, four poster canopied bed. The bathroom has twin wash basins, a roman whirlpool tub and a separate walk in overhead „rain‟ shower. Both the bedroom and living room are equipped with large flat-screen TV‟s (42”). 24-hr. Room Service. These suites are unusually large with an incorporated sitting area containing a sofa and two armchairs. The suite is furnished with a four-poster, king-sized bed and a writing desk. The bathroom has twin wash basins, a whirlpool tub and a separate walk-in overheard „rain‟ shower. The suite is fitted with a large, flat-screen TV (42”) and has a patio or balcony. This suite is furnished with a sofa, a writing desk and a four- poster king-sized bed. The bathroom has twin washbasins, a whirlpool tub and separate walk-in overhead „rain‟ shower. The suite is fitted with a large, flat-screen TV (42”) and has a balcony. This suite is furnished with a sofa, a writing desk and a four- poster, king-sized bed. The bathroom has twin washbasins, a whirlpool tub and separate walk-in overhead „rain‟ shower. The suite is fitted with a large, flat-screen TV (42”) and has a balcony or patio. There are two suites in this category fitted for wheelchair access. Exotic suites in individual circular buildings with cone-shaped roofs, patios, private pool sanctuaries and mahogany beds. The bathroom houses a Roman tub and walk –in overhead rain shower. 24-hr. Room Service. Exotic suites in individual circular buildings with cone-shaped roofs, patios and mahogany beds. The bathroom houses a Roman tub and walk –in overhead rain shower. 24-hr. Room Service. Expansive suite with bedroom and living area. All suites have a balcony or a patio. Suite is furnished with mahogany four poster king size bed. Newly refurbished bathroom features two marble wash basins, whirlpool tub and overhead “rain” shower. Suite has a large flat screen plasma TV (42”), 24-hr. Room Service and spectacular ocean view. Expansive rooms with bedroom and living area incorporated in one. All rooms have balcony or patio. Rooms are furnished with mahogany four poster beds. The bathroom has twin marble washbasins, a whirlpool tub and overhead „rain‟ shower. The suite is fitted with a large, flat-screen TV (42”). 24-hr. Room Service. Newly refurbished room with elegant pickled and mahogany furnishings and a four poster king size bed with large flat screen TV (42”). Bathroom features marble vanity and a bathtub/shower combination. All rooms have a patio. Large rooms featuring a four poster mahogany king size bed and sitting area. The bathroom houses a bathtub/shower combination. All rooms have a patio and you can walk out to the lush gardens. 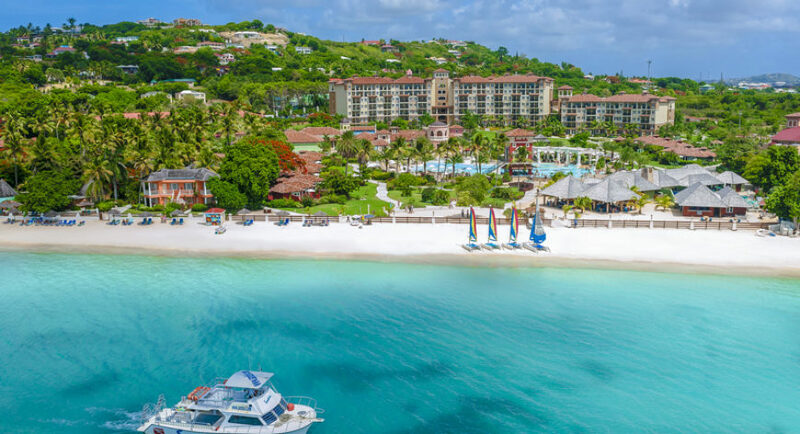 Large room which sits atop a bluff offering panoramic views of Dickenson Bay, resort gardens and main pool. 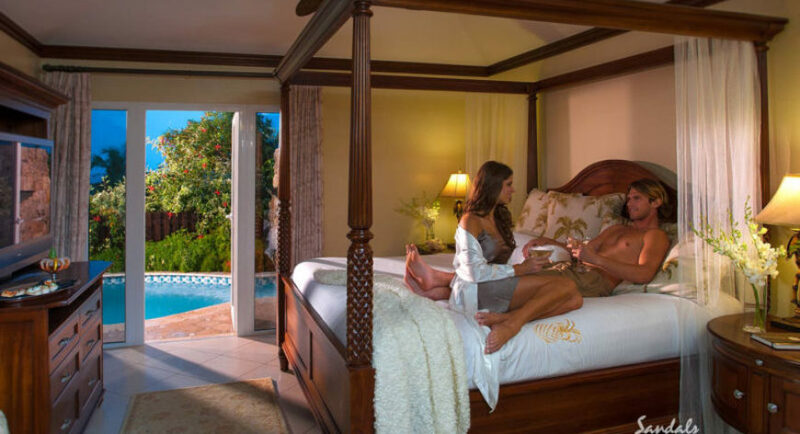 All rooms are furnished with four poster mahogany beds. The bathroom houses a bathtub/shower combination. All rooms offer a balcony. Shorts or jeans, t-shirts or polo shirts. Swimwear must be covered. Shirts and footwear required.. Dress Code : Resort Casual Attire. However, bare feet are permitted.